Learn Spanish the quick, easy and FUN way while enjoying a holiday adventure with us either at our Inn, Guest House or beach camp. You will be immersed in the culture of Mexico as you spend time with the local families, playing sports, fishing, playing music, dancing, playing games, cooking and eating. Have fun while learning at your own pace in a relaxed, non academic atmosphere...no tests, no homework, no pressure. Each program is individually designed to meet your specific needs based on your personal interests so you can learn as little or as much as you like....doing the things YOU like to do...when you want to do them...Remember...you're on vacation! Your hosts are a bilingual family dedicated to bringing the cultures together to learn from each other by sharing common every day experiences. Their friends and family all enjoy interacting with you to make you feel at home in our village. Apart from the language, learn to make tortillas and other Mexican dishes, dance the cumbia and take part in the local fiestas. You can stay for a weekend, or for months....you'll love it and come back again and again. 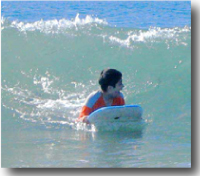 Anyone can learn Spanish....it's easy with our "Fun Learning" method designed by Shari Bondy, a University professor. Forget the dull classroom and come down to the beach! Prices vary according to program and accommodation. 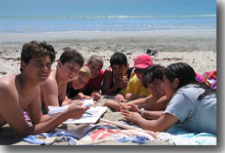 We host school groups as well and you can enroll your teen in one of our immersion camps through Synergia Learning Ventures (see more info on their website about the teen baja trips at www.synergia.us). Check out the pictures of some of our satisfied clients in the Photo Gallery/Spanish Immersion section.